The Korea Herald is publishing a series of articles on South Korea’s latest measures, hurdles and the market drive for hydrogen economy. This is the second installment. -- Ed. YONGIN, Gyeonggi Province -- Hyundai Motor, which introduced the world’s first mass produced fuel cell vehicle, is reviewing production of fuel cell trucks, hoping to achieve economies of scale in hydrogen-powered mobility. Cars powered by hydrogen are not as popular as electric vehicles. But battery cars are no match for FCEVs when it comes to larger commercial vehicles, which require longer driving ranges and shorter fill-up times. 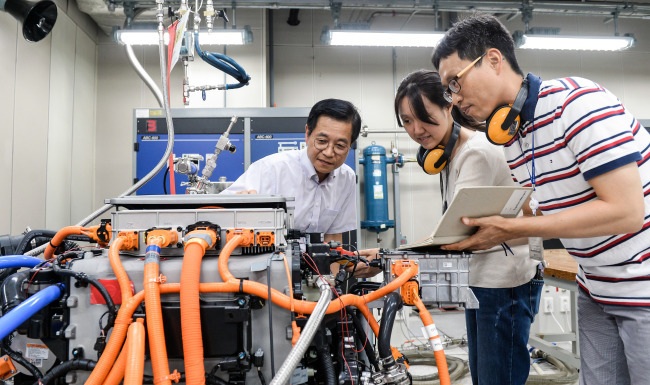 “We believe the level of technology in hydrogen-powered cars has reached a certain level,” said Kim Sae-hoon, vice president of Hyundai Motor’s fuel cell group, in an interview with The Korea Herald. The vice president in charge of Hyundai’s hydrogen project said that the carmaker was reviewing the production of commercial hydrogen-powered trucks, stressing that details were confidential. “What we can disclose for now is that we are currently developing hydrogen-powered 5-ton garbage trucks as part of the government project,” he said at Hyundai’s Eco-technology Development Center in Yongin, Gyeonggi Province, where its green car projects are being shaped. Hyundai is not the only automaker thinking about adopting fuel cell technology for commercial trucks. Toyota, Hyundai’s archrival in fuel cell cars alongside Honda, plans to produce a fuel cell truck that can travel 200 kilometers on a single charge. The US startup, Nikola Motor, also plans to launch hydrogen-electric trucks in 2020. Development as well as the production of bigger fuel cell cars can be more cost-effective, Kim said. Instead of developing a whole new, bigger stacks generating high electricity, hydrogen trucks might need the same stacks used for passenger vehicles, and only a couple of more modules. Hyundai plans to produce 1,000 fuel cell buses in Korea by 2020 as part of the national project led by Moon Jae-in government. It also plans to ease regulations related to renewable energy and hydrogen. The government announced on Monday that it would inject 110 billion won ($97 million) next year to boost hydrogen economy. The chief engineer educated in Germany referred to the shipping industry’s ongoing discussion about using hydrogen fuel cells to reduce carbon dioxide emission. The nation’s largest automaker is also hoping to boost its hydrogen drive through a high-profile alliance with global carmakers. 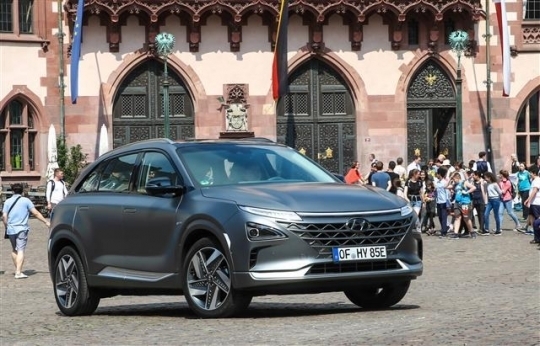 In June, Hyundai announced that it would strengthen the initiative of hydrogen cars in partnership with Audi, which leads Volkswagen Group’s hydrogen projects. Audi said it will unveil “a small series of fuel cell cars” in 2020. Through the alliance, the two firms are able to access each other’s intellectual property and share components, Kim said. “The alliance with Audi means we are able to partner with the 12 units of Volkswagen Group in collaborating on hydrogen car technology,” Kim said. Audi holds patent rights of a number of basic fuel cell technology originally developed by United Technologies a US company Hyundai used to work with in the late 1990s and early 2000s. With its alliance with Audi, Hyundai might not need to seek alternative ways not to infringe patent rights which can save both the time and cost, Kim said. 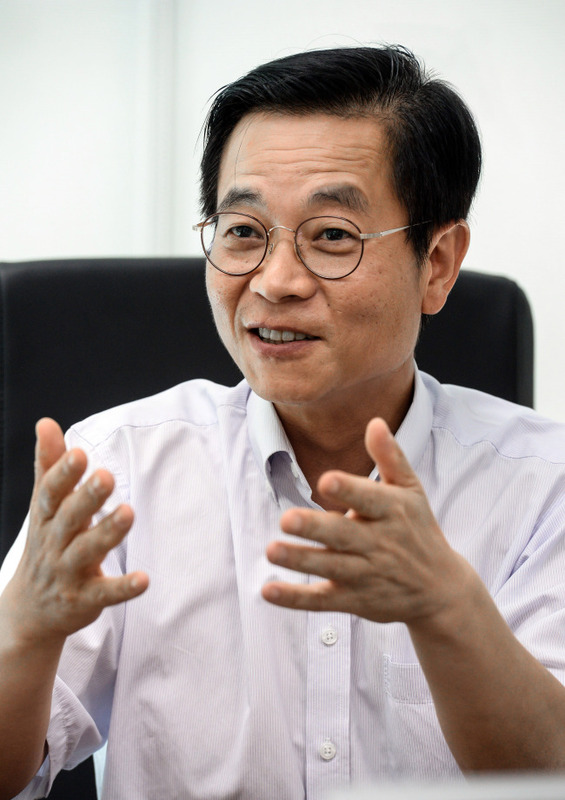 The bigger alliance creates the greater demand for hydrogen-powered vehicles, he stressed. Toyota has partnered with BMW while Honda teamed up with General Motors. Four other carmakers, Mercedes-Benz, Ford, Renault and Nissan, made similar alliances although Renault and Nissan recently pulled the plug on fuel cell cars to focus on electric cars. When asked for a possibility of Hyundai partnering with its archrival Toyota, however, Kim said it was unlikely. “Toyota is our good friend but there is no possibility that the two will form an alliance. We have different philosophies and have set different directions in terms of technology development of hydrogen vehicles,” he said. The competition is still on, but both groups should allow the creation of a bigger marked by refraining from efforts to monopolize hydrogen technologies. Hyundai is the leader in hydrogen technology, but it still has more to achieve. “We aim to make smaller, cheaper and more durable stacks so that they could fit into different types of hydrogen cars,” he said. “Developing a longer range is now meaningless as the range (609 kilometer per single charge) is long enough.” Stacks applied to Nexo is 20 percent smaller than those installed in its predecessor Tucson ix35, he added. Hyundai’s world’s first fuel cell car Tucson ix35 in 2013 travels 415 kilometers on a single charge. Its next model Nexo, hydrogen-powered crossover SUV launched in March, can achieve 609 kilometers on a full charge, beating its two rivals, Toyota Mirai with 502 kilometers and Honda Clarity with 589 kilometers. The longest range of electric vehicles on the road is, meanwhile, no longer than 500 kilometers.